A bare back yard is transformed by a statement structure. A barren back yard is no place for a beautiful bride. 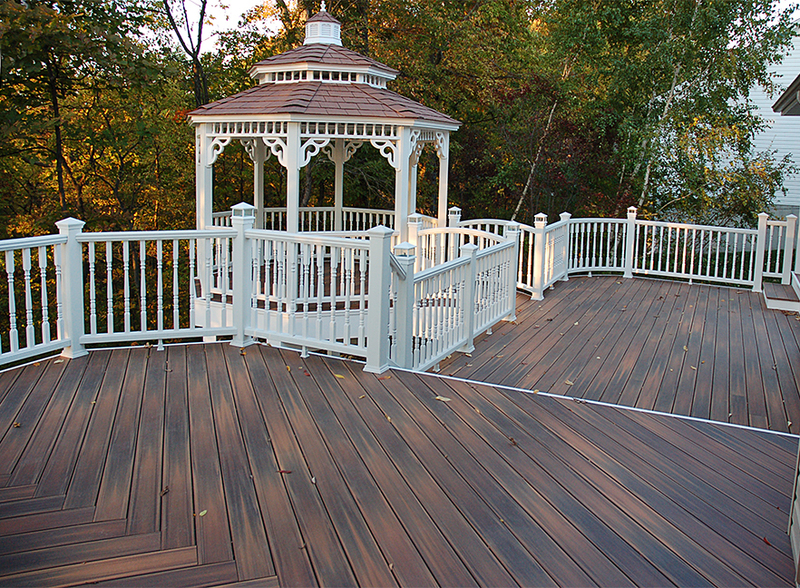 With an outdoor wedding in mind, these homeowners enlisted the help of California Custom Decks to design their dream deck in time for their spring nuptials. “We didn’t have any particular hard-set goals designed in mind initially,” says Mike Brueggenjohann of California Custom Decks. “They wanted something that was going to look really nice, really kind of pack the punch as far as the aesthetics of the area.” With such a significant amount of outdoor space, the design opportunities were endless. Brainstorming turned into a rough draft, and after a few tweaks and adjustments, the final draft was given the green light. Step by step, once the building begins, it usually takes about two and a half to three weeks to complete construction. From day one, the deck is built in full width from the ground up. Construction crews begin by marking the 750-square-foot area and digging the holes for the structure’s supports. After inspections are passed, piers are put in place and framing begins. “The gazebo is really the starting point for the detailing,” says Mike. A pagoda roof with a cupola top covers the gazebo while decorative Victorian braces fill each corner between the roof and the structural posts. Victorian era spindles and a classic white coloring continues the Victorian theme throughout the deck’s design including an arched bridge walkway. An eco-friendly wood alternative floor color from Fiberon incorporates a color streaked wood look that mirrors the multicolored woodland background of the back yard. Brown hues contrast the crisp white paint, creating flow between the structure and the surrounding forest. The floor panels of the lower portion of the deck connected to the gazebo are laid out horizontally, which gives a visually interesting juxtaposition next to the angled panels of the upper section. 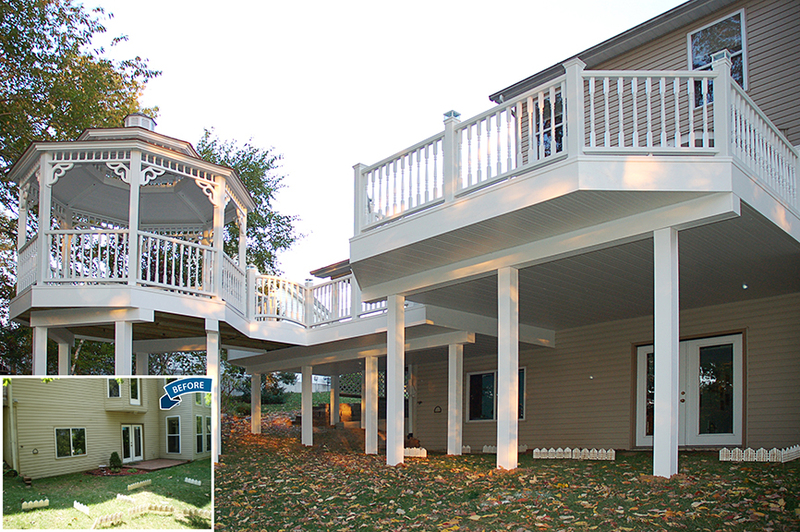 From start to finish, the outdoor transformations are tailor-made for the homeowners. Using their ideas and imagination, “it’s adding a unique element to the house, a unique space that they don’t already have inside,” says Mike. “When we build these different areas, whether it’s a deck or a gazebo or a room, we look at these projects as outdoor family rooms.” Mike hopes that by building a spacious outdoor oasis, he can encourage families to gravitate toward spending more time and making long lasting memories together. A monumental moment in this couple’s life occurred on their California Custom Deck. The homeowners were married in the gazebo as family and friends watched from surrounding chairs. While their back yard is now a place for future family bonding, it will also stand as a fixture in marking their family’s beginning.